Bengaluru, Feb 13 (IANS) BJP MLAs on Wednesday continued to create ruckus in the Karnataka Assembly demanding a judicial probe into the audio tape that allegedly mentioned Speaker K.R. Ramesh Kumar's name during a conversation between party leader B.S. Yeddyurappa and JD-S's Naganagouda Kandakur's son Sharanagouda on February 7. "The ruling coalition partners Congress and Janata Dal-Secular are fixed on a Special Investigation Team (SIT) probing into the audio tape, but we cannot trust the government agencies with the inquiry," Bharatiya Janata Party (BJP) legislator R. Ashoka told the media here. The audio tape issue has been rocking the House for the past two days, after the Speaker asked the state government to direct an SIT probe into it, and the BJP demanded a judicial inquiry. With continuous protests by the BJP, the House was adjourned till 3.30 p.m. on Wednesday. "We have been asking for a judicial probe or a House Committee probe into the issue to ensure a fair inquiry," Ashoka said. On the Speaker's directive, Chief Minister H.D. Kumaraswamy on Monday ordered the SIT probe into the audio tape he released on February 8 to expose BJP state President Yeddyurappa's alleged attempt to lure Kandakur into joining the BJP. The BJP, on the other hand, has been asserting that Yeddyurappa's voice in the audio tape was "doctored" and a SIT probe would lead to a witch hunt on its members. Meanwhile, the state BJP chief also alleged that the coalition partners were trying to "attack the opposition leaders" after BJP MLA from Hassan, Preetham Gowda, claimed JD-S workers pelted stones at his residence in Hassan. "Attempts are being made by the ruling party to intimidate the opposition leaders," Yeddyurappa told the media. 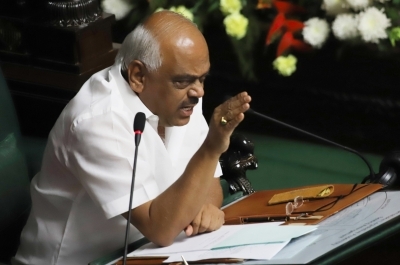 Amid the protests by the BJP in the House, the Karnataka Budget presented by Kumaraswamy on February 8, was yet to be discussed.